I want to tell you all about my private session with Amma in India. It was the single greatest moment of my whole experience in India. We had been told that while Bhagavan focused on spreading the Deeksha energy to as many people in the world as possible, Amma focused on giving people whatever they wanted, manifesting their desires, whether material, emotional or spiritual. She felt they could then concentrate better on releasing whatever was in the way of their heart-opening and awakening through the Deeksha process. The Golden City coordinator told our group of 150 that for $500 for a private session with Amma, we would have only 5 minutes in which we could ask for two things. She irritably emphasized how quickly it would be over, and seemed to be discouraging us. I knew I wanted to do anyway, and spent much time thinking about what I wanted to ask for, and what was the most spiritually correct way to ask for it! The next evening, two friends and I found ourselves momentarily alone with the coordinator in the dorm lobby. We began to ask her a few more questions about it. Suddenly, incomprehensively, her normally brusk nature seemed to melt away and she softly and lovingly assured us we could take as long as we wanted and ask whatever we wanted, and that Amma would know what we wanted anyway. We stared at her transformation blankly. We began to realize she was inadvertently channeling a personal message directly from Amma for us. My friends quickly decided to join me in this adventure. On the very last day, I sat on the floor at Amma’s ashram, waiting with many others as Amma was escorted in and took her chair. My initial thought was that she simply looked like a nice woman. I was surprised she didn’t seem radiant to me, or special in some dramatic way. I was second in line. To my surprise, as I sat watching my friend, Grace, who was first in front of me, go up to take her turn, I began to “see” Amma with my inner eyes that I use when I do my spiritual healing work. The solid Indian woman before me, while not exactly disappearing, was clearly the apparition belonging to what appeared above, behind, around, and throughout her body. Her true nature appeared as some kind of mythical creature, that I just can’t find words to describe… I mean the words just don’t touch the experience. Imagine being able to see the Phoenix rising from the ashes, appearing as the most tender, gentle, compassionate being possible (and those words feel so coarse in comparison). After all the time I’d spent planning what I wanted to ask for, when my turn came, I just sat there at her feet, blinded by tears streaming down my face. The Dasa (monk) with her finally said, “You know you can ask for something.” I blurted out something about a heart-opening and something about my work growing and reaching many people. Although Amma and the Dasa both said something in English to me, I was in an altered state and couldn’t understand. As I stumbled away toward the bench along the wall, I fell out of her energy field. We had worried so much about having just 5 minutes to say everything we’d wanted to say. Instead I felt she gave me Eternity, and I only took 2 minutes. Grace and I, and then the next woman, Sharon, just sat there for a long time, stunned, with our heads leaning on each other. When we were finally ushered out, Indians surrounded us, asking for Deeksha. I did maybe 5 Deekshas, still in a stunned state. Somehow another friend, Brenda, and I found each other and helped each other stagger away from the melee. 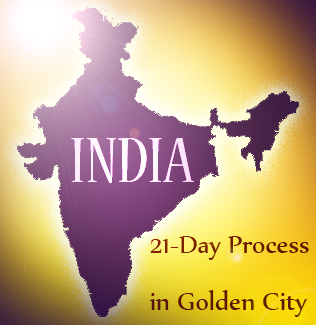 It took me many months to even begin to integrate my experience in the 21-day Process in Golden City with Amma and Bhagavan and the lovely Dasas. As of this writing, 7 months have passed. I continually feel Amma’s blessings at work in my life. I do find my heart to be much more open, and my work has opened to me in new ways as well. I feel more like I’m “home”, tho I wouldn’t have thought I wasn’t before. The feeling of Eternity, which is what had most brought me to tears, comes by for a visit from time to time. I deeply cherish this whole experience and the gift of now being able to give “Deeksha”, helping all people in their awakening.